Congratulations to Stephanie Berry for winning this giveaway! We are such huge fans of Little Vida, a children’s luxury brand that represents the best designers and eco-conscious lines out there. We’ve been fighting over the awesome care package they sent, filled with cashmere and suede, everything immaculately made and you can really feel the quality that Little Vida is known for. 1. Check out Little Vida and tell us your favorite item or line. 2. Like Little Vida and Small Fry on Facebook. 3. Follow Little Vida and Small Fry on Twitter. 4. Instagram or tweet a picture of a favorite outfit of your little ones using #smallfrythreads so we can see it! 5. 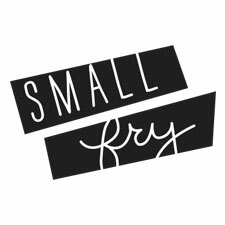 Put Small Fry’s button on your site or blog (link to http://smallfryblog.com) for 5 additional entries. Note: To get these babes to sit still to capture the beauty of these Little Vida pieces, they had a ball playing with the Olliblocks from Caravan Shoppe. We love their kid’s line of downloads, perfect to print on your own and assemble as a family for play and party time! Get 20% off with the code itsaparty. This shop is amazing! It’s hard to pick just one item or line. I really like the Chloe line and the bobo choses line. Their dresses are my favorite. They have so many cute ones to choose from. Thank you for sharing this shop. I absolutely love the Stella McCartney line. Love the Stella McCartney for boys sweaters! I would love the pepe desert boots or Simone baby girl jumper, adorable! I followed on Facebook , twitter and hashtagged on ig!! The Appaman ski jacket is so cute! Oh my heavens.. those pepe mary janes are to die for!! following both on FB and twitter! LOVE the Caramel baby & child hopkins skinny jeans!! my boy needs the Scotch Shrunk knit cardigan!!! I LOVE you guys! One of my favorite blogs! I went to that site and just about died! I have 2 little girls and I was hyperventilating at all of the accessories and clothes and little suits. Gah! How do you pick a favorite? I just can’t. I liked Little Vida & Small Fry on FB. I follow Little Vida & Small Fry on Twitter. Now following Little Vida and Small Fry on Twitter! Oh my, SO cute! I love the Nellystella line, but ADORE theLouis Louise papillon dress for my princess & seriously the Scotch Shrunk line is PERFECT for my little misters! ;]] Love love love! Like Little Vada on FB. I’m a huge fan of the Stella McCartney line of clothes for kids! I love the Bobo Choses bici body onesie. I love little boys in these little muscle tees! I did 1,2,4, and 5. LOVE LOVE the Stella skinnies and Caramel cardigans! Posted your button on my blog but its private! the scotch r’belle puffy skirt, eek! I love this brand. I’m ordering those green shoes today! I have to say Scotch Shrunk is my fav for my little boy! Follow on instagram and liked both on facebook! I love the Appaman carpenter cards. Hi, I love your blogs. I have followed you both on twitter and Facebook. I love the Go Gently Baby candy dress on Little Vida. I added your button to my blog. I follow little vida on twitter. thank you for hosting such a great giveaway. I just spent wayyy too long drooling over everything. I love the organic line, it’s a lot cuter than most organics I’ve seen. lovingggg the boys Stella McCartney kids stripe jumper! Love Small Fry on FB! Liked Little Vida on FB! 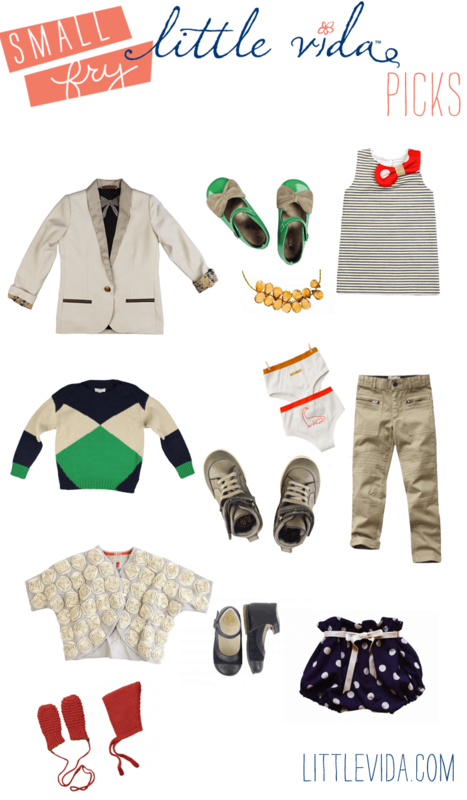 I love all the mini Rodini tops for boys! Great giveaway! Absolutely in LOVE with the Oeuf Mustaches. How fun! LOVE the cardigan with the elbow patches! thanks for the chance to win! I watched the video…my favorite line is Tella McCartney Kids! Since Jarvis has a shoe fetish (my boy likes to be naked most of the time but will put shoes on!) I would have to say the Pepe Ape tennis shoes would be an excellent addition to his shoe collection. Love all of little vidas site especially the shoes. plus they have super great service when you shop there! The desert boots are too cute! I think if I win I have to break down and buy myself a matching pair! I like the Pepe Ape shoes! Just liked SF & Vida on FB! J’adore everything on Vida’s site and I have a 2-year-old boy and a 5-year-old girl so it’s hard to choose just one item, but I especially want the Mini Rodini panda sweatpants for my little boy — he LOVES pandas! Love that La Petite Luce edith dress!! I love the La Petite Luce line, and I especially love the reversible bloomers. So adorable and would look amazing in pictures. I like Little Vida on FB. I totally liked both on facebook. Loved the weekend brief for boys! so incredibly adorable! I Like Little Vida and Small Fry on Facebook. I Follow Little Vida and Small Fry on Twitter. I really like the old soles shoes! I love all the pépé line shoes!! Beautiful! I am DYING over the Scotch R’belle pull sweater with the Peter Pan collar and bow!!! I following both on Twitter! I just tagged a couple of photos onto #smallfrythreads! love the scotch shrunk pull—amazing! I love the fox tail & mask! I love the Pepé hip hop sneakers. love the Appaman gym sweats! Love it all, especially the Pepé desert boots! So cute. Like both pages on Facebook via Megan Clifford Davey. Love the Stella McCartney line! The Stella McCartney Lolo dress is to die for! I also liked both on Facebook. I also liked both on twitter. I love the Chloe and Stella McCartney line! However, there is so many cute things that I just might go broke. I like the Jackson Dungarees. Love when I can find something girly that is not pink. Peter pan collars get me everytime! I liked Small Fry and Little Vida on FB. LOVE the Chloé polka dot dress! in love with la petite, edith dress i could eat up! the littl citrine necklace is amazing, and makes it better because it’s my birthstone. cheers! now liking little vida and small fry on facebook, good stuff!